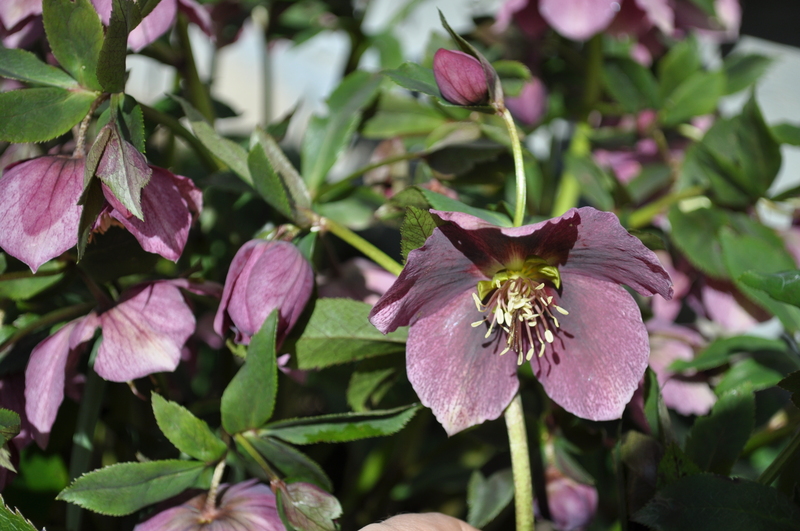 Also known as Hellebore. My favorite in the garden this March. Have you ever tried to hard boil an egg from your very own chicken and had it turn out nearly impossible to peel? Bits of egg came away with the peel and the thing ended up looking mutilated. Method 1. 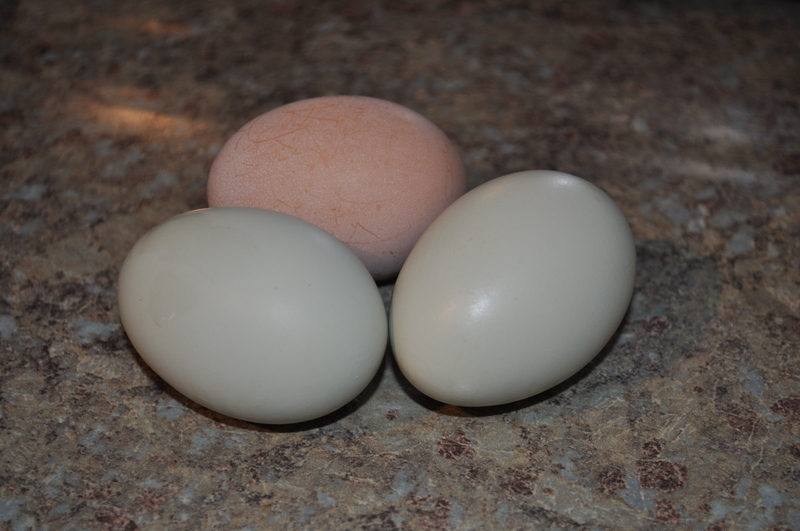 Wait: The reason farm eggs are hard to boil and peel is because they are so fresh! If you keep your eggs in the refrigerator for 2 weeks and then boil for 10 minutes, they should peel easily. This is a great solution for those eggs of questionable age in mid-summer when the girls are laying so quickly that it’s hard to keep up your egg consumption. If a batch of eggs starts to seem a little older, then boil them for snacking. This leads to the question… why are grocery store eggs usually so easy to boil and peel? The logical answer is that they are already older. Hmmmmmmm. Method 2. Steam: Let’s say you don’t have time to age your eggs. You need boiled eggs now!! Instead of boiling, put them in a steamer. When you get a good steam going turn the timer to 20 minutes. You’re eggs should peel beautifully. Method 3: Baking Soda: Sprinkle baking soda in your cold water and add eggs. Bring to a boil for ten minutes. Bon appetit! Are you looking for a Free fun nature activity for the kids that can be done with a few items from around the house? Or are you looking for an artistic centerpiece for your table? Or are you dying to plant your garden but the last frost hasn’t come yet? Try a terrarium! I live in the Pacific Northwest which is a green and verdant place. It is the sort that vegetation will reclaim quickly if man neglects their taming of it. It is called the Evergreen State for our beautiful conifers, but the greens of the rich things that grow here would rival emerald Ireland when the clouds part and the blue skies shine. There is nothing like a NW sky when it clears on those first spring days for the rain can seem ceaseless in the wintertime. It rains here enough that nearby we have our very own Hoh Rainforest. The rainforest is a soft dripping place with mosses a plenty, and alluring scents of dank rich earth. The rainforest has led me to a strange moss obsession. I gather these things up in terrariums and foster them and create tiny rain forests in my living room. When I can’t be out of doors… I keep it nearby in a terrarium. This is a fun and free form of indoor art and it has the added bonus of helping to keep your indoor air filtered naturally, and when you tire of it you can return it to the forest from whence it came. 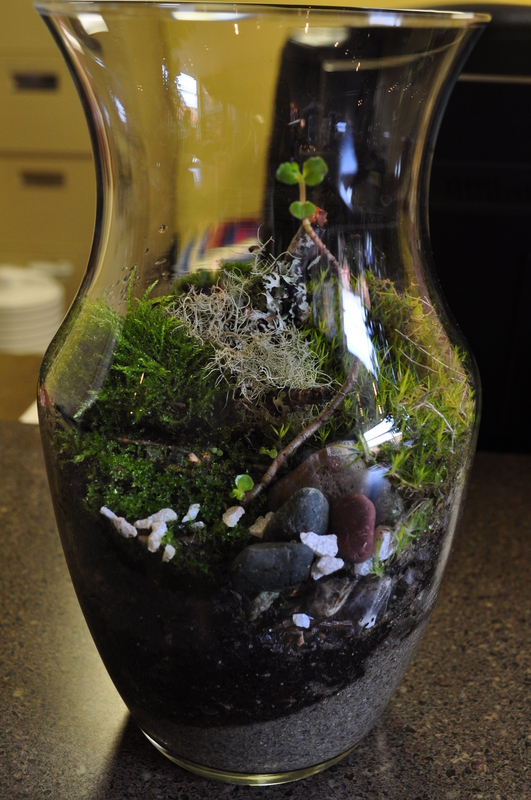 I make my terrariums with things dug up around the property like mosses, lichen encrusted limbs, licorice ferns, and perennial sedums and ground covers from my garden. I try to only dig up mosses where they are plentiful and won’t be missed or if they are growing in what should be a moss free zone (like the roof). I like to use outdoor plants that I can keep indoors for a season but will be just as happy out in a shaded patio. 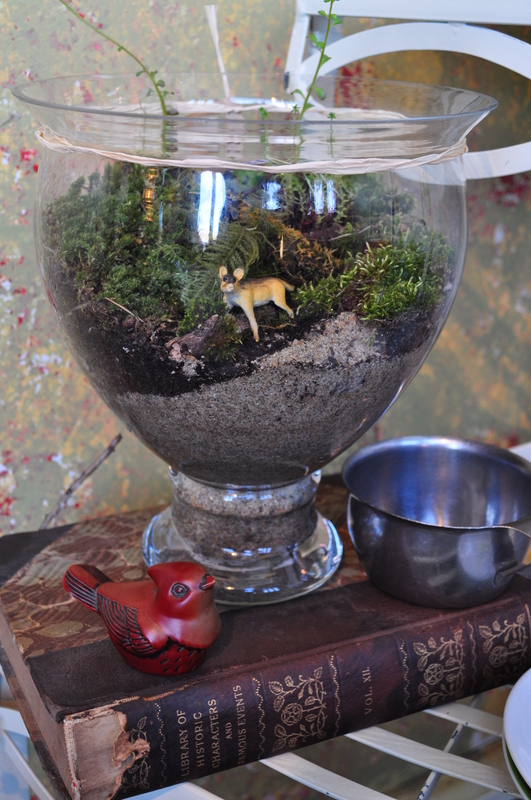 All you really need for this project is Sand (I use old sand from the sandbox), potting soil, a glass vase, bowl, or jar and a variety of mossy covered things found in the woods. You may use small figurines or toys, pretty rocks or shells to add to the effect of a little world. First, put a little sand at the bottom for drainage, but also for visual interest. Sometimes I will just put the sand on one side of a vase and soil on the other to create a little beach. If you have activated charcoal it is also beneficial in a terrarium to retain moisture while keeping the roots from rotting, but a terrarium can be happy without it. After soil is added, place a plant of interest like a little fern or sedum or a small mossy branch. Then cover the remaining soil with mosses. It is fun to find more than one kind of moss. Add your figurines or rocks if desired. Then give it a thorough watering. 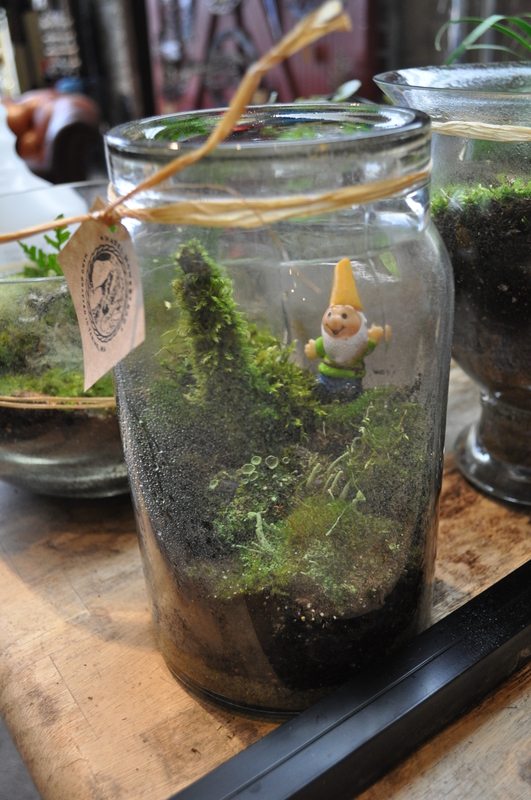 Mist your terrarium with water as needed to keep the moss happy. If you have grown tired of your terrarium or it is looking unhappy, just take it out in the woods and set the native plants free. 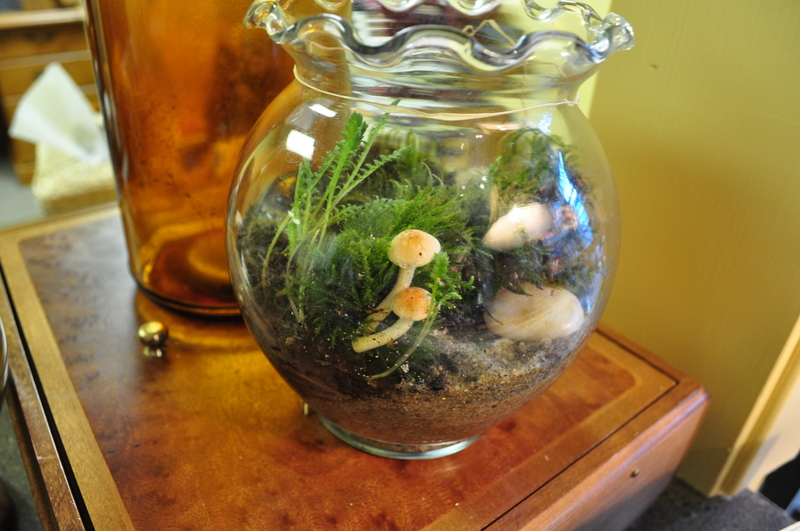 Warning, if you do add little branches or rotten wood to your terrarium it may sprout mushrooms, which may be poisonous. Unless you are an expert in mushrooms it is not advisable to handle them. If you are doing this project with small children who could be tempted by mushrooms you may want to steer clear of old branches in your project, and to be safe check your terrarium routinely and discard it’s inhabitants if mushrooms should appear. Nestled in the rolling hills of South Thurston County is a little historic district known as Tenino, WA. Tenino must be pronounced properly and some would describe it as 10-9-0. There is mystery surrounding the origin of the town’s name. The similarity to a series of numbers led to conjecture over the possibility that the number could be related to the railroad system that ran through these parts. However, no train number or any such thing could be traced in the railroad records… and the theory died. Originally this place was called Hodgden Station for the land claimant Stephen Hodgden which leads credence to the other name theory. It is said that Tenino is a Native American word meaning “crossroads” or “meeting place”. Hodgden station was a way station on the Oregon Trail to its terminus in Tumwater and beyond. The lay of the land makes this tiny community a natural crossroads North, South, East and West. The Old Highway 99 which was Washington’s Interstate before the Freeway system can still take you from Seattle to Portland, and Hwy 507 junctions here as well, running between Yelm and Centralia and beyond. Perhaps at one time Tenino was a crossroads for earlier people such as the Salish. But the true meaning of the name may be lost to the passage of time and out of memory. Tenino is a Stone City and contains certain natural and man-made wonders. How many towns can boast a public swimming pool in an old sandstone quarry with a cascading waterfall, which legend would have you believe is more than 100 feet deep with cranes and equipment still lurking at the bottom beyond the reach of man? The city park extends beyond the pool with baseball fields, hiking and intercity biking trails, a Quarry House from the days of Stone extraction, the Depot Museum, and a one room school house called the Ticknor School. At the Depot Museum you can learn all about Tenino’s Depression Era Wooden Money. Yes, Tenino had its very own legal tenure, which has been newly minted in 2013 and can be obtained at Scotty B’s 50 Style Diner and used in most establishments in town. 2 Blocks north of the Tenino City Park is the Historic District which is evidence of the boom that came about in the early part of the 20th century. You will find the locally quarried stone in much of Tenino’s architecture and a self walking tour brochure is available at the Depot Museum. Most historic buildings in town currently house small businesses like gift shops, antiques, restaurants, the Scattercreek Winery and Aunt Kate’s Chocolates. There are several natural areas of interest like the two Sandstone quarries outside of the city park, one of which can be seen cut out of the hillside on the south end of town. Continue down south Old Hwy 99 and view rare natural Western, WA prairies near Colvin Ranch which is of interest in and of itself as the Ranch is still owned by one of our area’s Pioneer families, though they have donated some of the original land claim to prairie preservation. Besides Colvin Ranch there are several agricultural areas around Tenino like the Alplaca Ranch, Nelson Ranch and the farms of the Skookumchuck Valley including plant nurseries that open to the public in the spring. It’s a beautiful drive out the Skookumchuck and you’ll be rewarded at the end of the valley with a visit to a natural area with access to the Skookumchuck River. 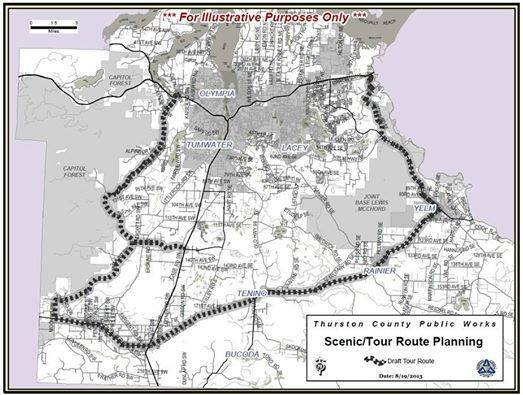 Tenino will be a stop on the newly proposed Thurston Bountiful Highway which takes that back roads from the Nisqually Valley looping around to Tenino and then continuing to the Capital Forest. Tenino, WA is known around South Puget Sound as quirky little town. I’m not altogether sure how it came by this reputation. But its citizens embrace the distinction. When to visit? The best time to visit Western Washington is in the late spring until October if you strive to miss the worst of the rains. Tenino offers several summertime perks. The Farmer’s Market is every Saturday from June through September. The Tenino Depot Museum is also seasonal through the summer. Two wine tours happen annually in May and September. Oregon Trail Days and Four Square Mile Music Festival are the Fourth Weekend of July and include the Oregon Trail Days Parade and the Blue Ribbon Pie contest. Where to Stay? There are no Hotels in Tenino however there are nice places to stay in nearby Centralia or Tumwater. Offut Lake Resort offers cabins, RV sites and camping, plus fine dining at the Lady of the Lake Restaurant. From the resort you may even be able to hear the wolves of Wolf Haven just down the road. Visit www.offutlake.com or give them a call at 360-264-2438. If water parks appeal to you The Great Wolf Lodge is another place to stay and located just 10 minutes from Tenino in Grand Mound. Sandstone Café: Breakfast & Lunch at 273 Sussex Ave W.
Scotty B’s 50’s Style Diner 500 Sussex Ave W.
Inspired by Ma (Caroline) Ingalls I have decided that Monday will be Baking Day. My budget is currently squeezed and after analyzing my expenses I’ve come to the conclusion that the area in which I can squeeze even more is the food budget. I have always cooked dinner, but I haven’t always made everything from scratch. The advantages to baking or cooking from scratch are that you know exactly what ingredients are in your food. You do not need to worry about preservatives and questionable things like partially hydrogenated oils. You can eliminate the worry of pesticides and genetically modified foods by using organic ingredients as well. I believe that dedicating a day to baking is the most efficient way to do time intensive cooking. If I tackle these food projects individually throughout the week then each time I will need to get all the ingredients and cooking implements out. I will also need to wash everything multiple times. But if I’m cooking bread and then making pizza dough, my mixer doesn’t really need much washing in between uses. Also, while the oven is heated I can bake multiple things so long as they are at compatible temperatures. The only drawbacks I really experience is that I wish I had 4 loaf pans instead of 2. Occasionally the oven is full, and I need to wait for one thing to finish while I start something else, but I can always keep up on the dishes while I’m waiting. While I have been endeavoring to do Baking Day for a while, each week I have been adding new items to my repertoire. Not all recipes are worthy of sharing yet, but that’s alright because I am still learning how to make raviolis and bagels and some items that take a certain level of trial and error. 2 loaves of Wheat Bread: One side note about the bread. I have a new mill!! 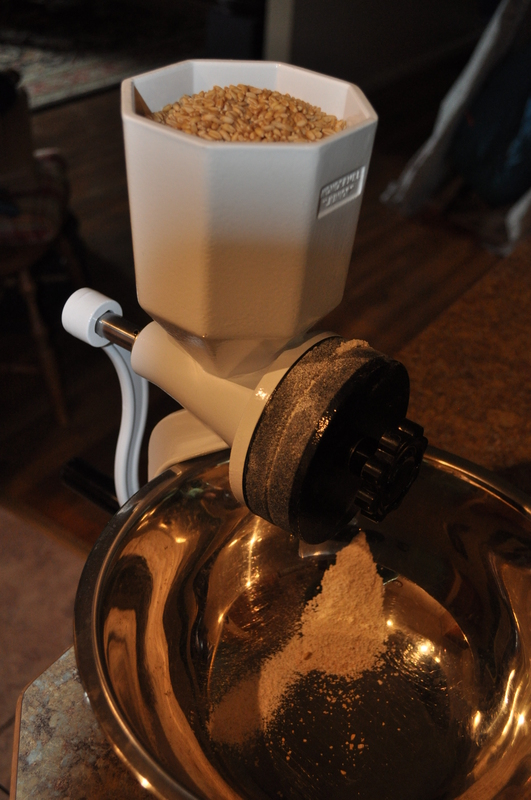 So I ground my required 2 cups of wheat flower, and I used organic flour for the rest. I think they turned out nicely. 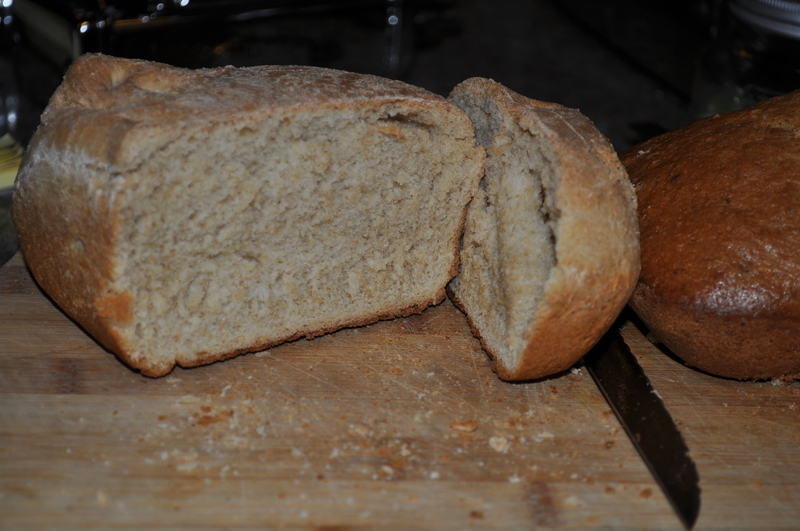 I enjoy this bread best fresh and one loaf is used for dinner on Monday night while it’s still hot. 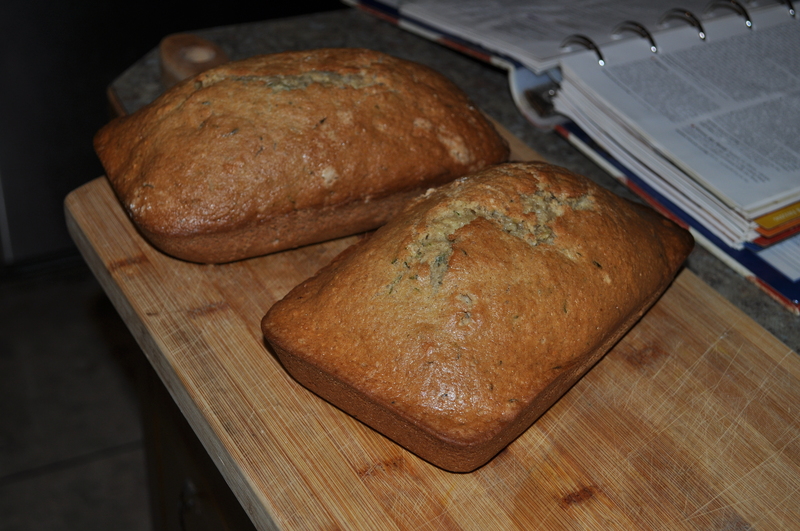 2 loaves Zucchini Bread: Hey, you’ve gotta love zucchini bread in March. I keep 2 cup portions in the freezer that are left over from the inevitable summer bumper crop. The kids often have a slice for breakfast. 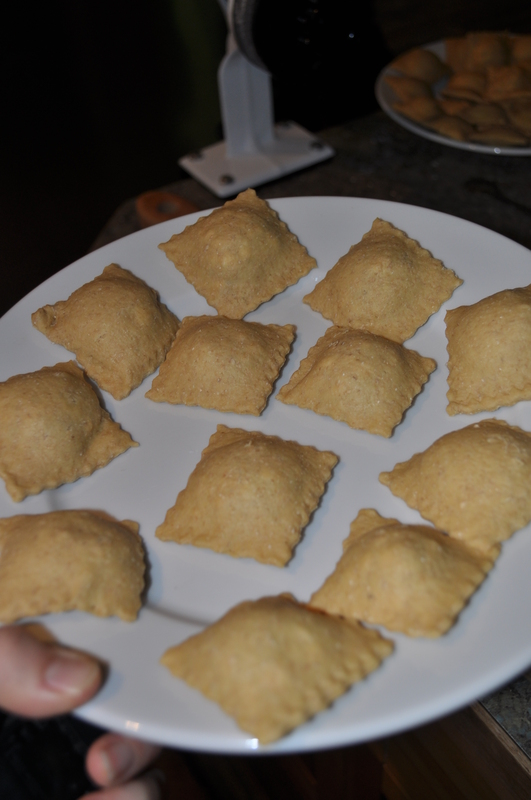 Ravioli: This was the first time I made ravioli….or any pasta actually. So maybe I should have started with an egg noodle (which I will try next Monday) but I had some ingredients in the fridge that needed to be used up that I thought would be yummy in a ravioli. I don’t like to have anything go to waste and that goal often dictates my recipes when allowable. I also used hand ground wheat for this recipe as well as our fresh eggs. These have been frozen for use on a night when there isn’t much time to cook. Pizza Dough: I just made the dough and put it in the refrigerator to be used another night instead of having frozen pizzas. We did end up eating this on Tuesday. I didn’t have pepperoni or anything so I got creative with the meat. 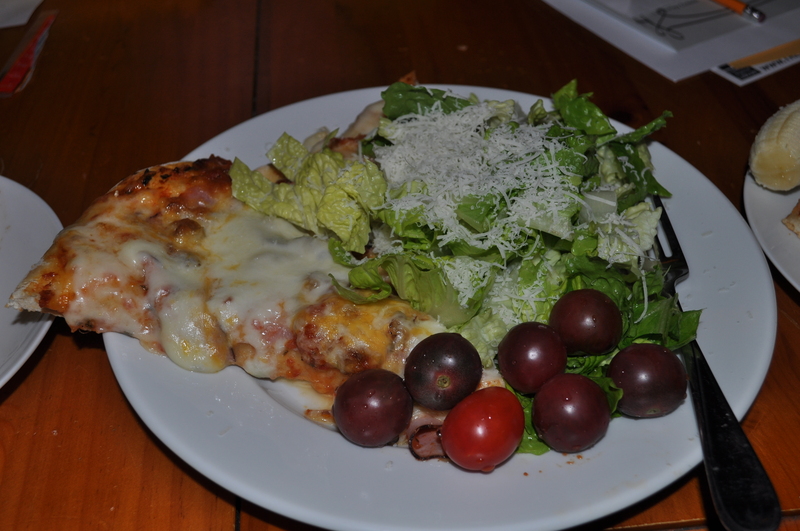 Thin sliced ham and bacon crumbles turned out great on this pizza. I also used a mix of cheeses and my homemade marinara sauce. Yum! Marinara: See my Marinara Mash-up posting for details and recipe. I used this marinara with Monday’s dinner and bread. 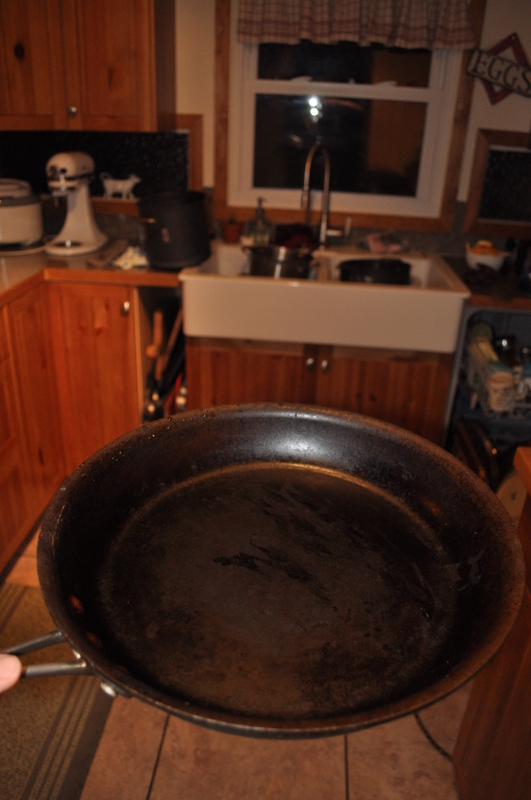 Then it was my base sauce for our Tuesday pizza. Then I still had some leftover and had some with pasta for lunch on Wednesday. Cookies: At this point in my Monday baking goal I was running out of time!! So I did enlist my son to make the chocolate chip cookies for treats throughout the week. He made them all himself. (This is another goal of mine which is to ensure that my children can bake and cook when they leave my household. Home economics aren’t taught in schools anymore). The biggest trick with cookies is to keep the kids and husband from gorging on them the first day. What else: Some other food items that come up on baking day, but didn’t happen this week: Bagels, granola and cheesy breads. Things I would like to learn for baking day: Cereal, crackers, and other pastas. Do you have go-to make in advance meals that you want to share, or something I should include on my Baking Day? Tonight dinner was fresh baked bread, broccoli, and chicken smothered in home-made marinara with cheese. My family always asks about the sauce. What kind of sauce is this? Did you make it? In other words… is it store bought? I think the reason they have such a hard time nailing down my signature marinara sauce taste is because it is different every time I make it. All whirled through the food processor and then simmered for half an hour. 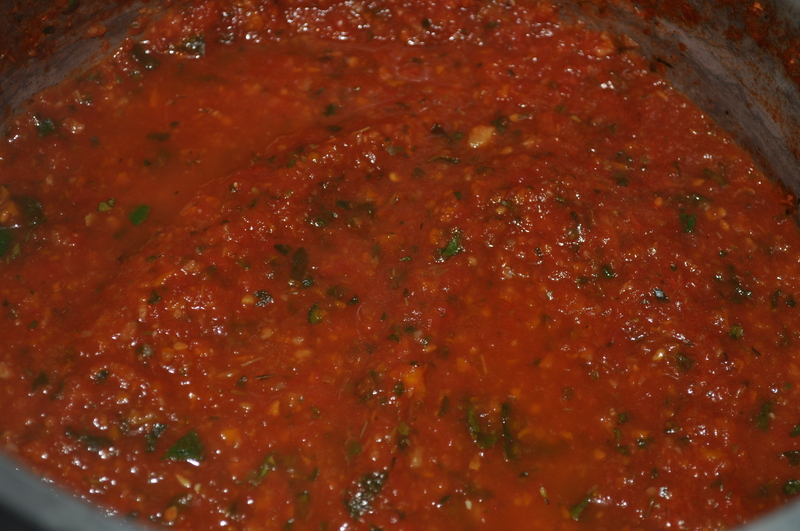 The tomatoes, garlic, and herbs are really all this sauce needs (all of which are items I had laid up for the winter) but I like to use up fresh ingredients from the fridge in this recipe, or excess produce in the summertime. Marinara can be a true waste not, want not adventure. Here are some of my other favorite marinara add-ins: carrots, peppers, basil, greens like spinach or chard, summer squashes, onions and all garlic varieties, capers, olives and wine (substitute wine for sugar), and of course… meat. You may grate or food-process any of these items to add flavor and nutrients (your kids will have no idea) to your dinner. You may cook your ingredients anywhere from ten minutes (I do min. 10 minutes on home canned tomatoes…. just in case) at a brisk simmer for a fresh tasting distinct sauce to a slow-cook of several hours for a rich and densely melded marinara sauce. No Recipe? Now, we’re Cooking.